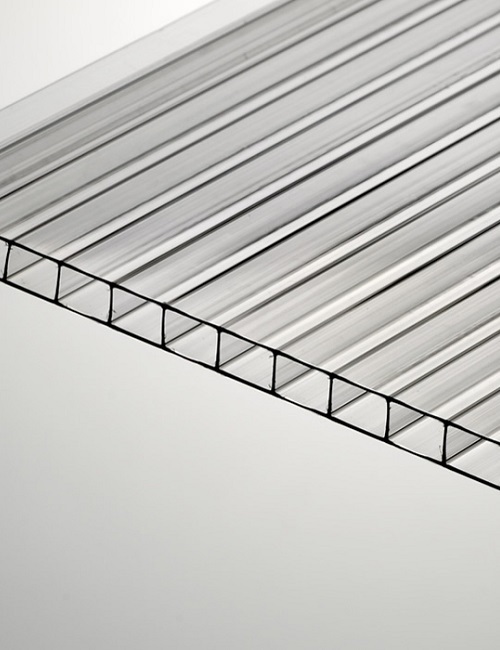 Twin Wall Polycarbonate roofing sheets feature a strong cellular construction providing thermal insulation and excellent impact resistance. This is a high quality product that combines elegant, modern appeal with high performance; and is selected by architects and building professionals for both commercial and residential constructions. 10mm Twin wall channels trap air between 2 walls allowing the flutes to run the length of the panel. The panel with flutes are installed vertically and panel ends are capped with a UV capping on both sides allowing interior condensation to escape. UV coating provides 99.9% protection from harmful UV rays. Contemporary flat profile – stylish and appealing. Lightweight (1/15th the weight of glass). Flexible and versatile – can be cold curved on site. Suitable for high wind areas. Excellent weather and water tightness. 5 year warranty against hail damage for hail stones measuring up to 15mm in diameter. Complementing range of extrusions and installation accessories available to maximise ease and efficiency of installation. Twin wall polycarbonate should be stored and protected against sun, rain, etc. As prolonged exposure to sunlight may cause the protective masking stick making removal difficult. Stacking and storage of sheets should be on a flat surface with the longest lengths on the bottom. This is to prevent the sheet warping and forming waves if the sheet were to be stored on an uneven surface. As with all glazing and plastic materials, care should be used when handling and transporting to prevent scratches and damage to the edges of the sheets. Cleaning twin wall polycarbonate can help the material last longer. When cleaning you must be sure not to use an abrasive cleaner. We recommend using warm soapy water or purchasing some of our anti static plastic cleaner. Twin Wall Polycarbonate sheet can be fully recycled back to its original monomer. For further information on recycling polycarbonate sheet please click here.